Special features: commentary by actor Jack Black and director Richard Linklater; commentary by the kids from "School of Rock"; lessons learned in "School of Rock"; Jack Black's pitch to Led Zepplin; "School of Rock" music video; Toronto Film Festival piece; MTV diary: Jack Black; Dewey Finn's history of rock-interactive feature; original theatrical web site archive; theatrical trailer. Jack Black, Joan Cusack, Mike White, Sarah Silverman, Lee Wilkof, Kate McGregor-Stewart, Adam Pascal, Suzzanne Douglas, Joey Gaydos, Jr., Miranda Cosgrove, Kevin Clark, Robert Tsai, Maryam Hassan, Rebecca Brown, Caitlin Hale, Aleisha Allen. When his band votes him out due to his embarrasing musical antics, Dewey has to make the rent somehow. After intercepting a call for his substitute-teacher roomie Ned, Dewey finds himself in front of a class of elite elementary school students. 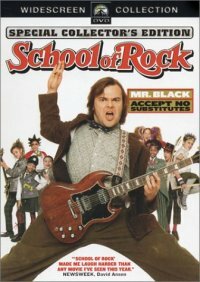 Dewey decides to take on the music program and makes it his goal to teach them the gospel of rock and roll. His ulterior motive is to get them to compete against his former band for a cash prize. DVD, Region 1; Widescreen, Dolby Digital, DTS. Funny submitted by andreahubert on June 27, 2012, 9:44pm This is a funny movie. Great! submitted by alumeng.ajl on July 23, 2012, 2:38pm This was really funny! School of Rock submitted by SBNB on July 12, 2014, 10:54pm I wouldn't say it's funny, but it is entertaining. And the music's not bad. funny, good music submitted by airgood on August 5, 2014, 10:55am The plot is completely unbelievable. Jack Black is pretty good and funny; the kids are also very well cast. The music in it is great! Funny submitted by tshish on July 9, 2016, 8:54pm Jack Black is so funny in this. Hollywood, Calif. : Paramount, , c2003. Music -- Performance -- Drama.